Discover the Secrets to Generate $1 Million per Month! Imagine taking a field trip with Jay Geier and his 5X clients! Spend a day touring, investigating, learning and getting clarity on what it takes to operate a $12 Million Practice. Learn the strategies needed to take your practice to the next level, by taking a look at what a practice earning $1 million per month does on a daily basis. You’ll be given tools on how to educate and train every single department in your office, holding them accountable. Understand the importance of having a vision and direction, and share that vision and your goals with your team! Learn exactly how you can manage the growth and change at your practice and gain new tools and strategies that you can use to get that extra boost you have been looking for! 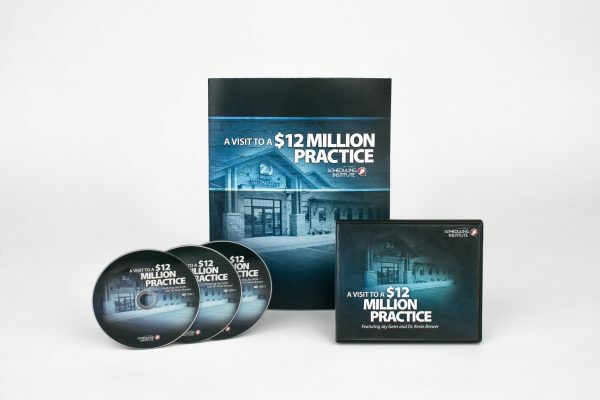 With this kit, you will learn from this Doctor and his team, including his Business Manager, Team Leaders, Front Desk Assistants, Financial Coordinator and Marketing Director on exactly what it takes to operate a $12 Million Practice. Jay Geier and Dr. Brewer go into detail about what it takes to run a $12 Million Practice. You will experience their morning huddles, strategic positioning, daily expectations and minimum standards, effective marketing strategies and how their clinical, front office and hygiene teams operate on a day-to-day basis! Follow along in your workbook, as if you were actually on a field trip to Dr. Brewer’s office! In this workbook, you will find samples of the morning huddle calendar, internal and external marketing pieces, clinical exam notes, front office duties, tracking tools, patient paperwork, hygiene scheduling guidelines and more!